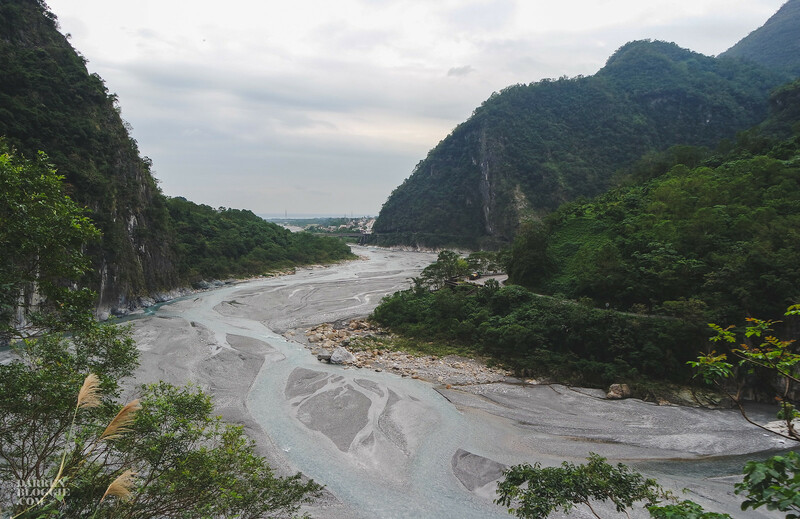 The park was established on November 28 1986 where both the public and government agencies came to realize that serious damage was being done to its natural resources. 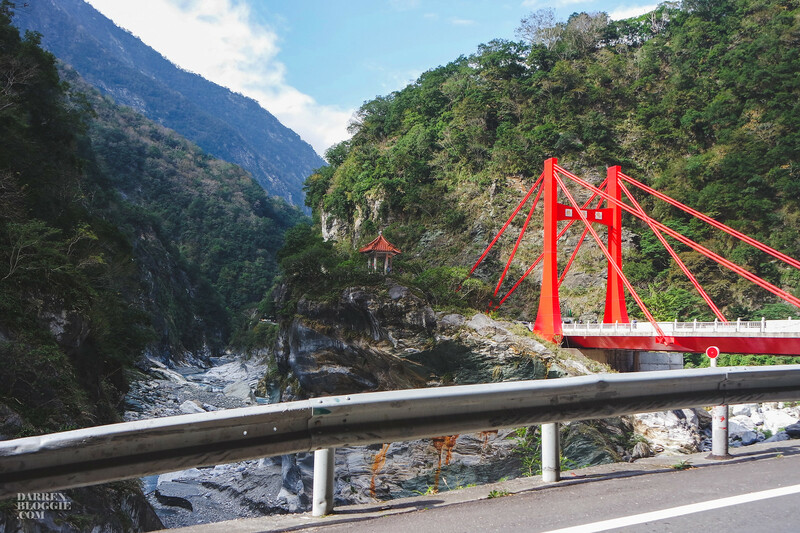 With its marble-walled canyons, lush vegetation and mountainous landscape, Taroko is definitely one of Taiwan’s top tourist destination. 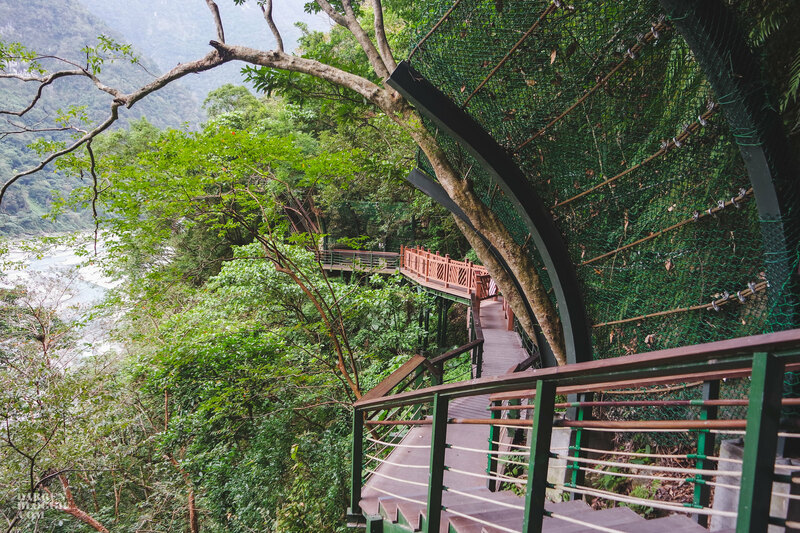 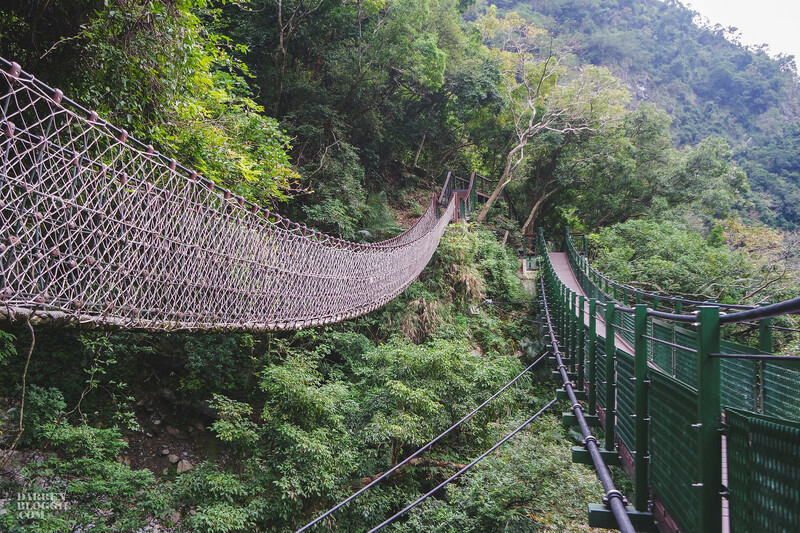 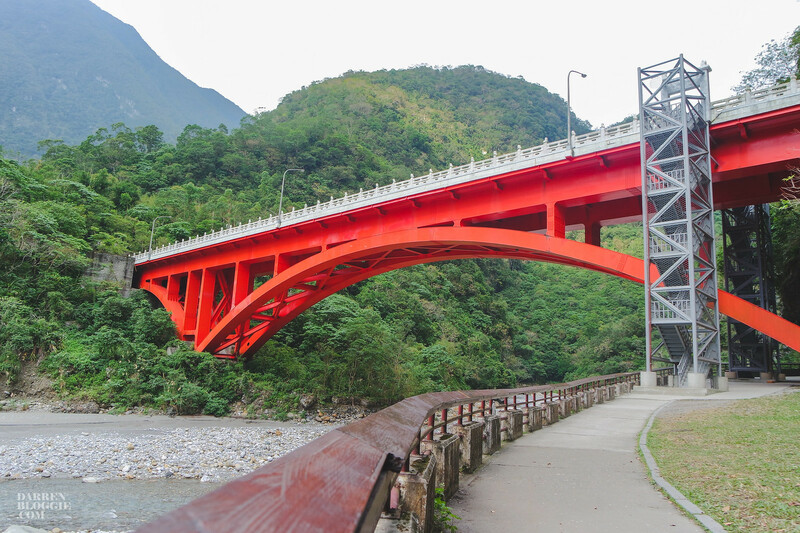 Spanning across Taichung, Nantou and Hualien, the park covers 1200 sq km and rises from sea level in the east to over 3700m further west. 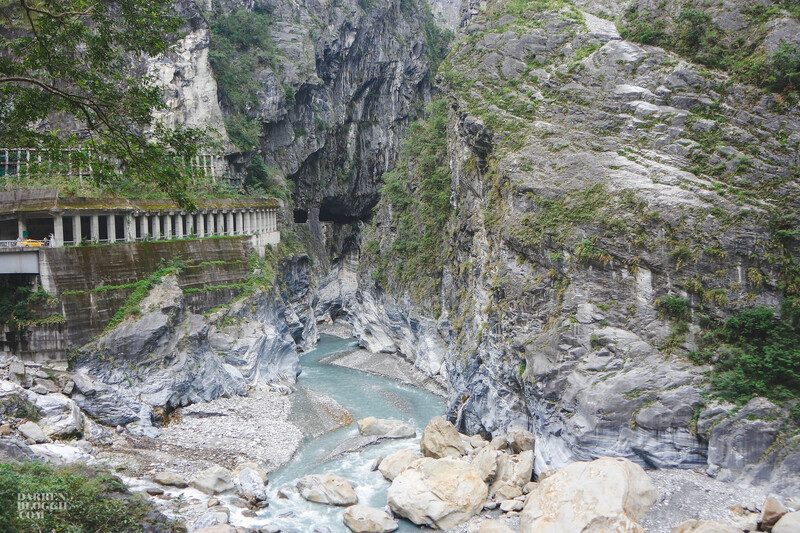 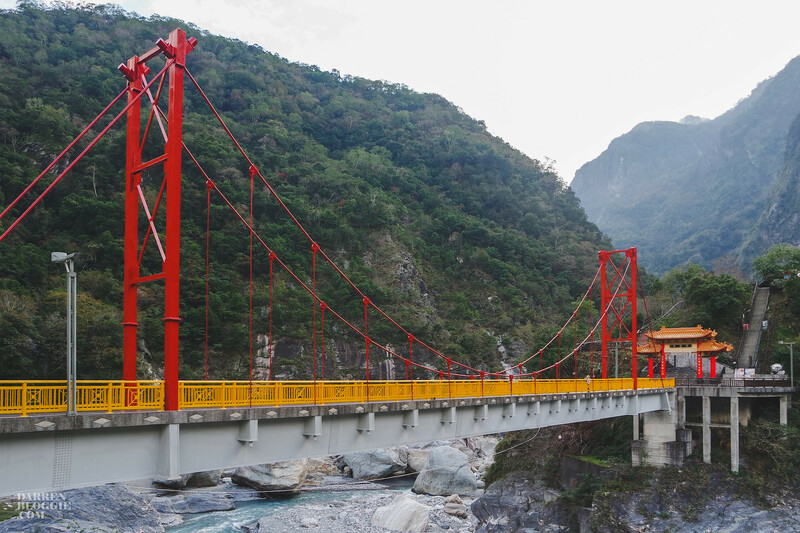 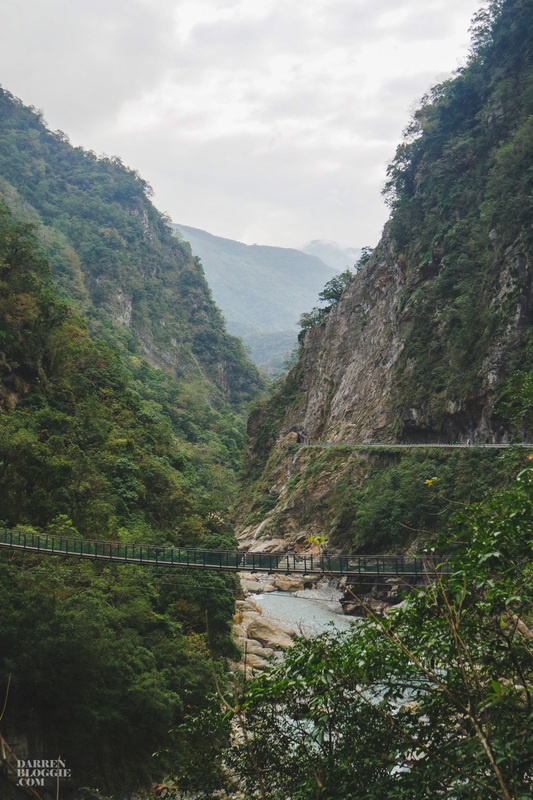 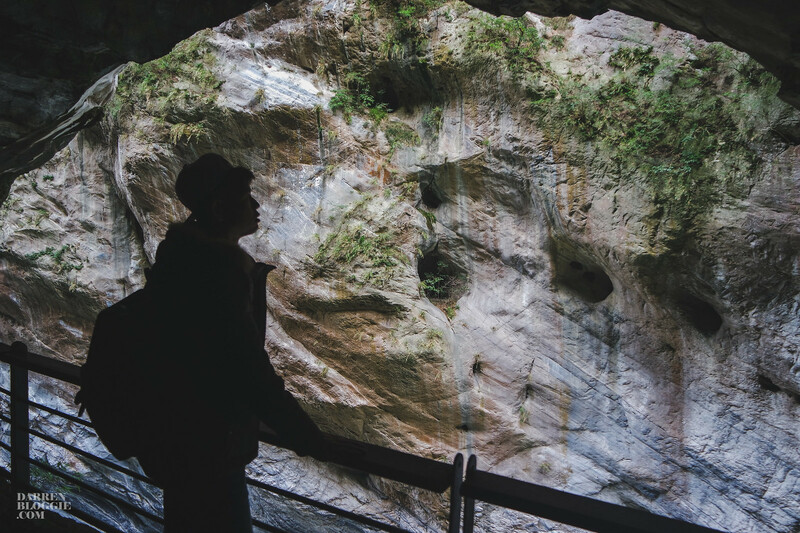 Taroko Gorge and its surrounding area are well know for their abundant supply of marble where it was given a nickname as “The Marble Gorge”. 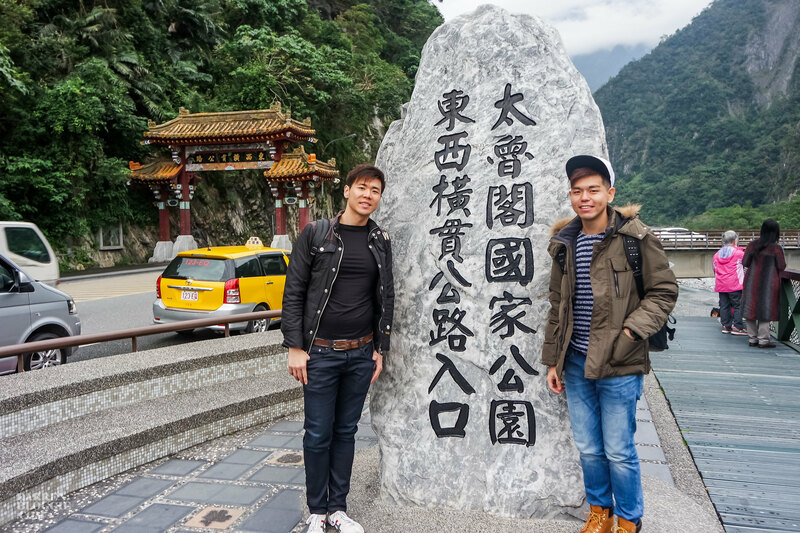 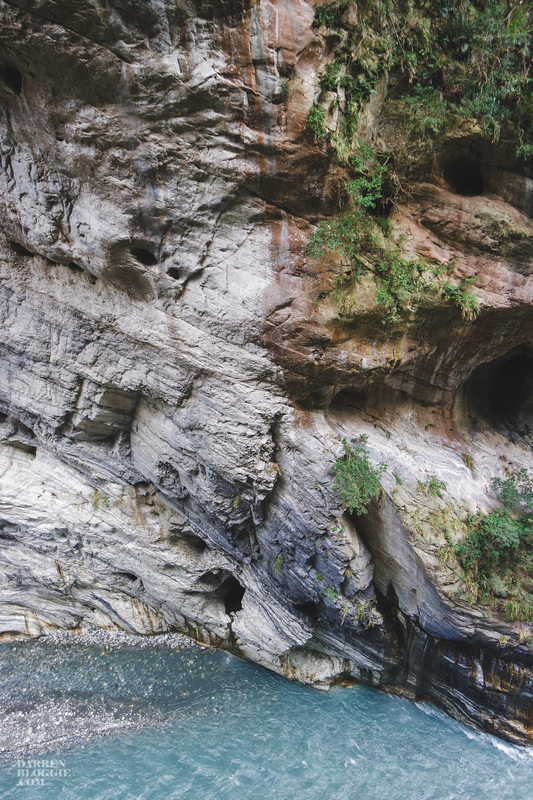 The rock you see now in Taroko began over 200 million years ago on the bottom of the ocean. 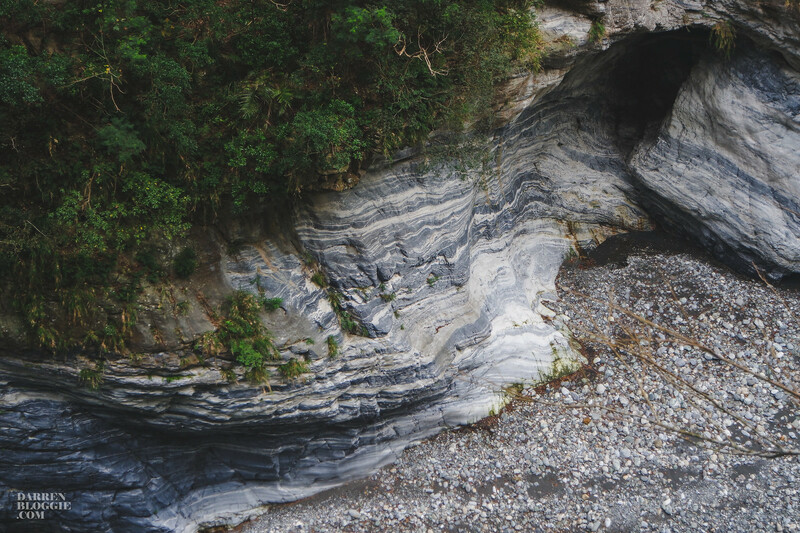 Uplifting forces from the plate collision pushed this rock above the surface of the ocean to where we see it today. 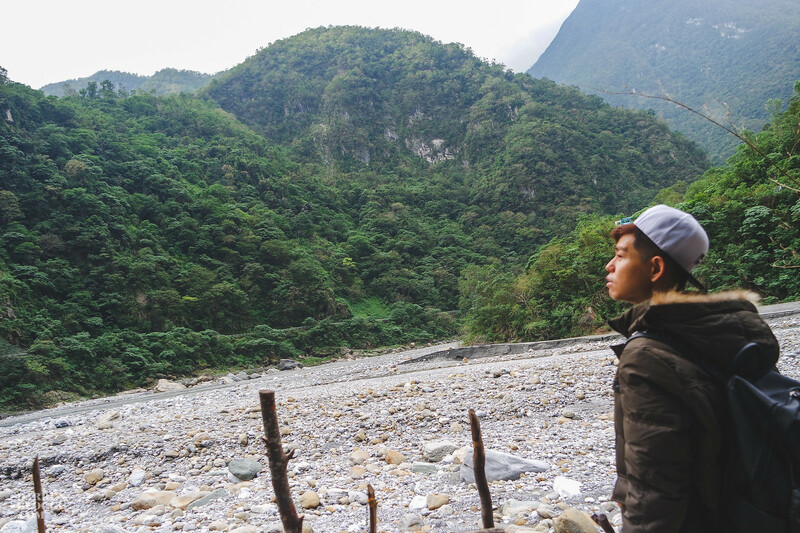 There are a few scenic spots and trail that you can explore, depending on the time you have. 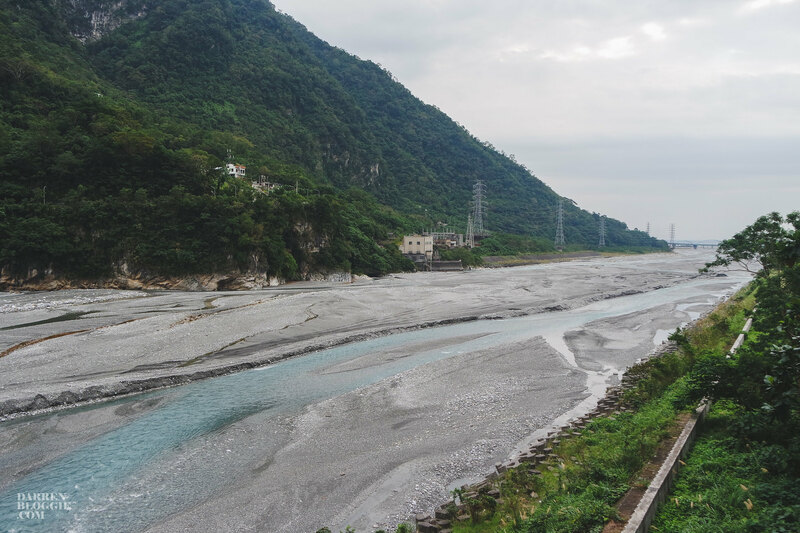 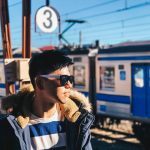 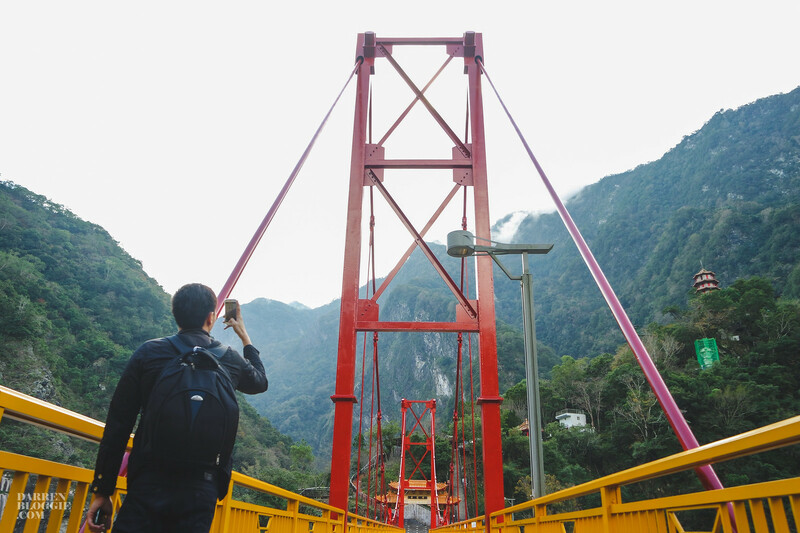 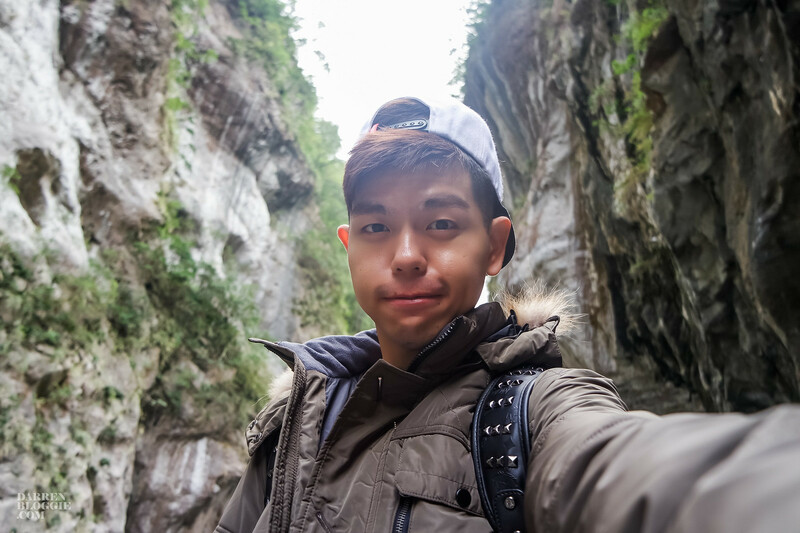 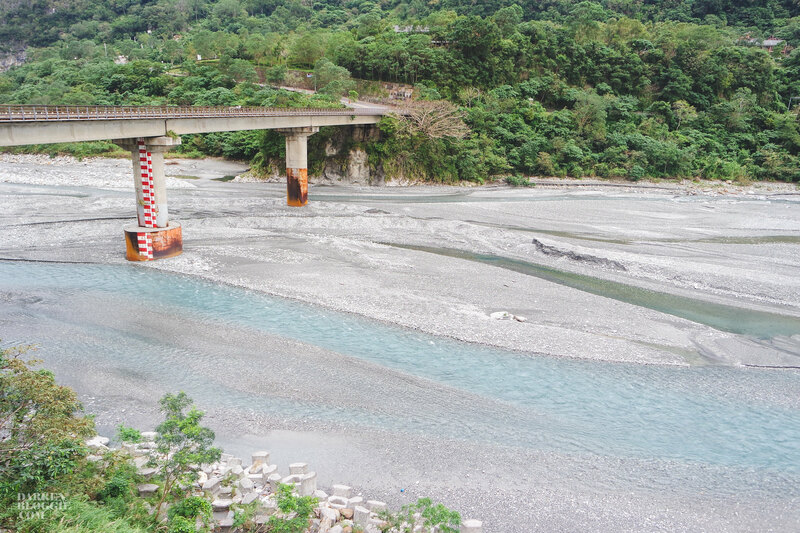 As we are traveling our way from Hualien to Taichung, and visiting these places along the way, we didn’t manage to cover all the trails, but at least some of them. 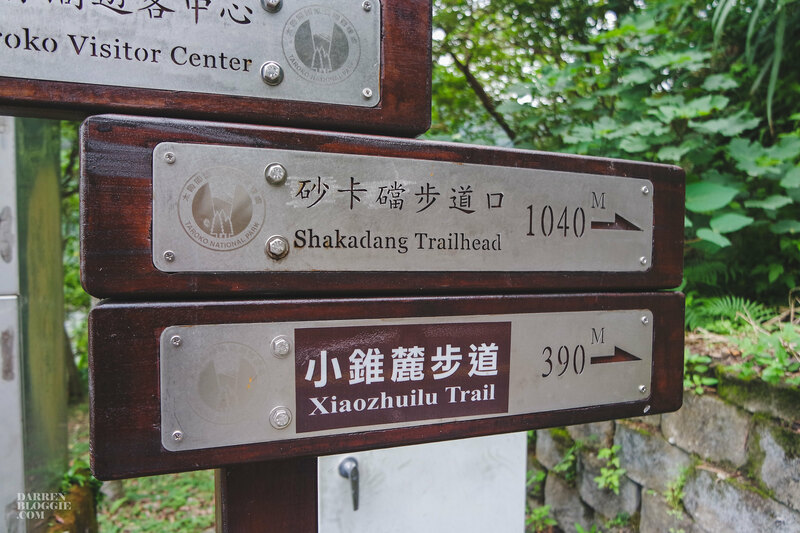 Shakadang Trail is also know as the “Mysterious Valley Trail” built along the river cliff so travelers can easily observe both the rock folds and plant ecosystem beside in the river valley. 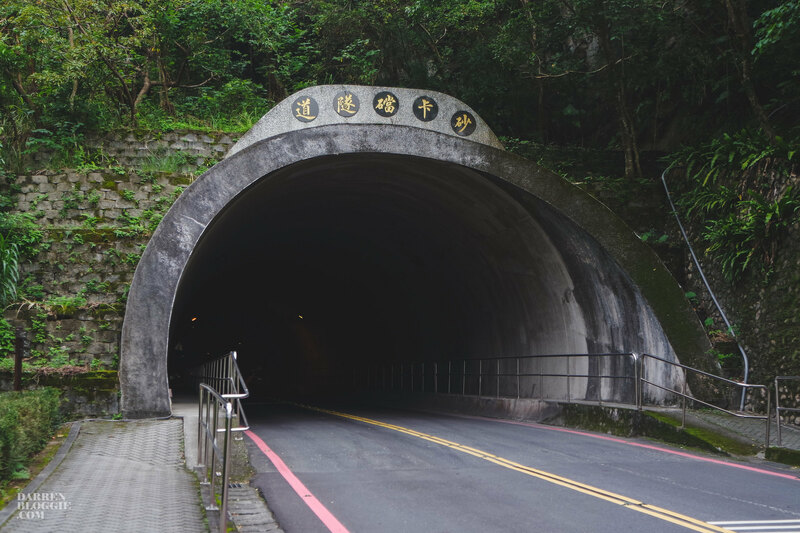 In May, it is the season when Tung tree flowers bloom, making the trail a pleasant flower hallway with flowers filling the air like snowflakes. 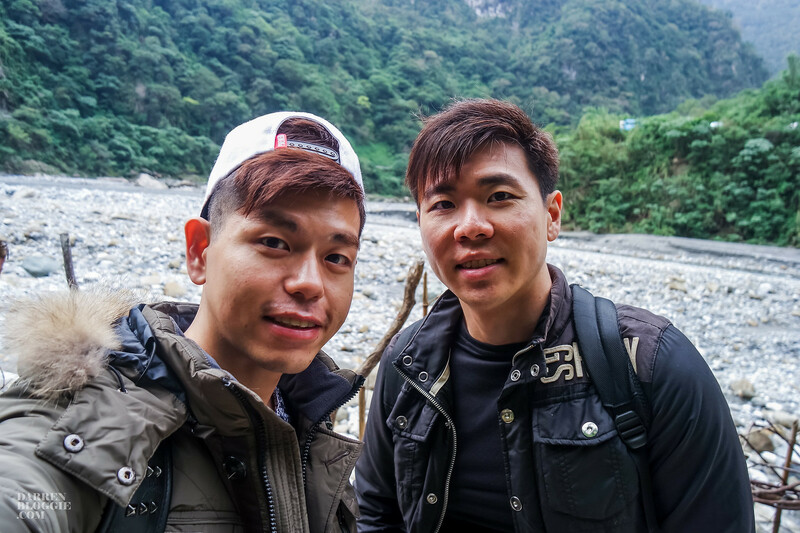 Next, we arrived at Yanzikou (Swallow Grotto) where the rock cliffs of Liwu River gorge seem to reach to heaven while the river runs its swiftest and the distance between the gorge walls so narrow that they almost seem to touch each other. 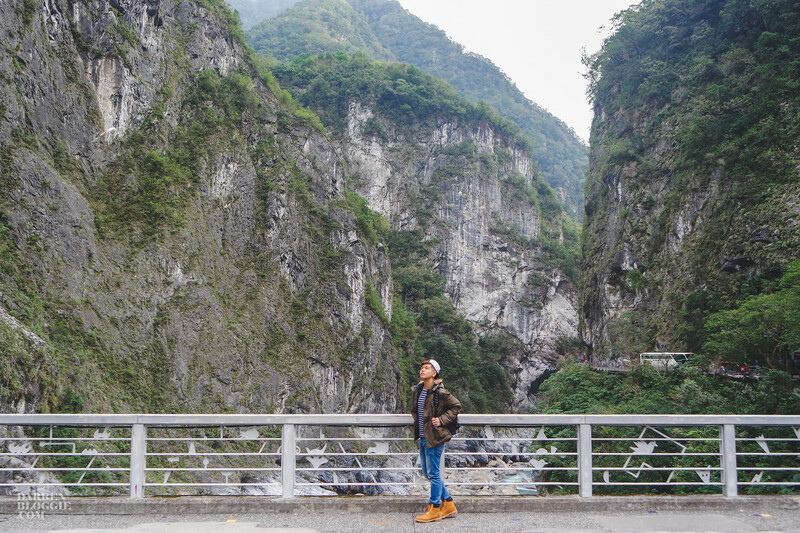 Starting from the entrance of Swallow Grotto to the Jinheng Bridge, you can enjoy the sights of Liwu River, pothholes on the cliff faces as well as the famous rock formation “Chieftian’s profile rock”. 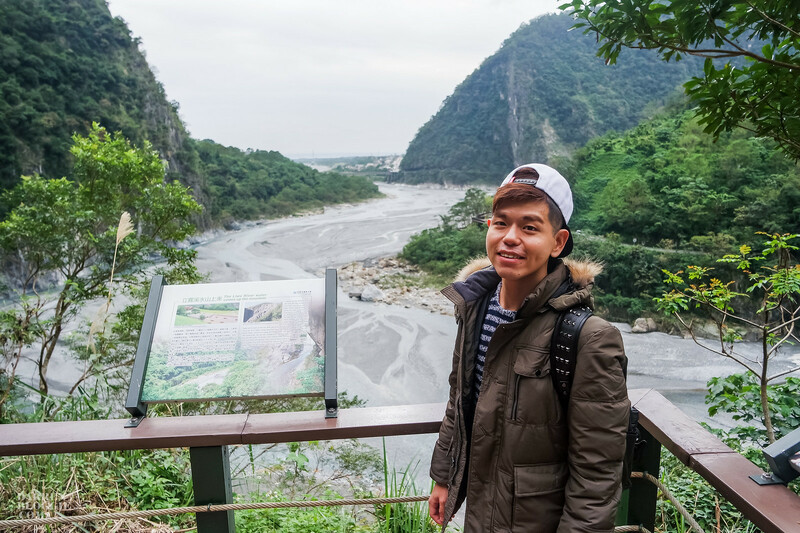 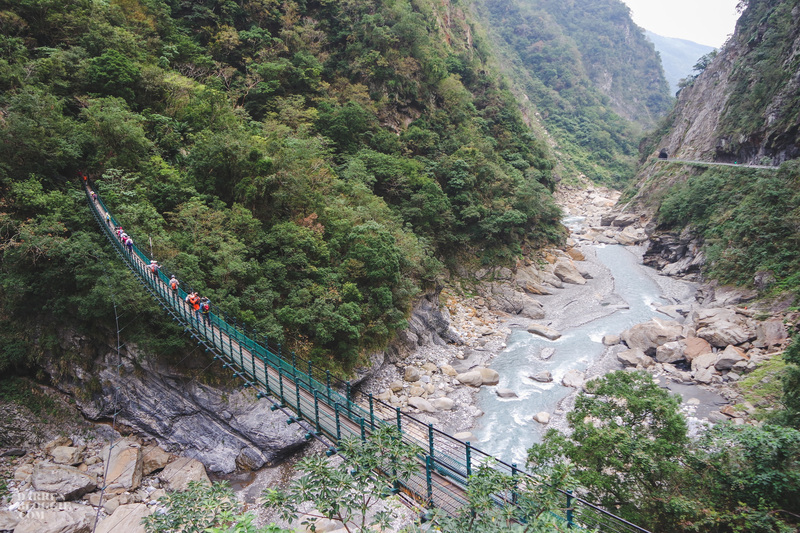 After our trail at Yanzikou, we arrived at Tianxiang, a large river terrace recreational area in Taroko National Park. 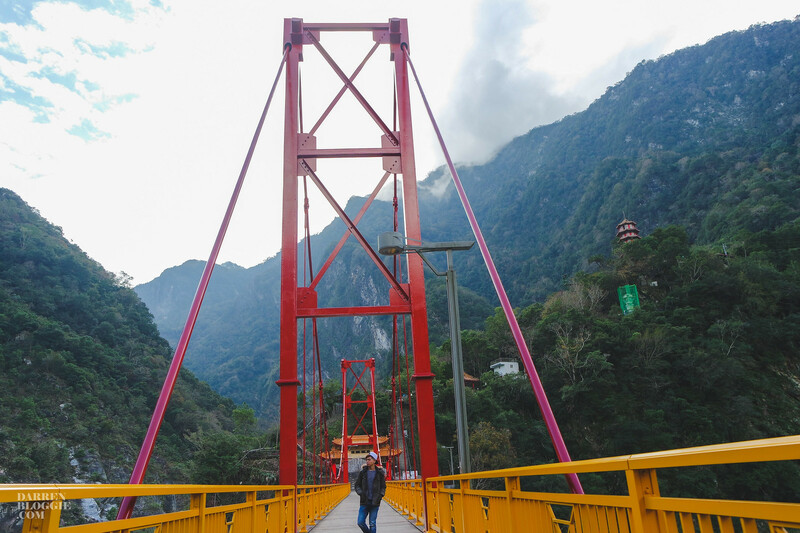 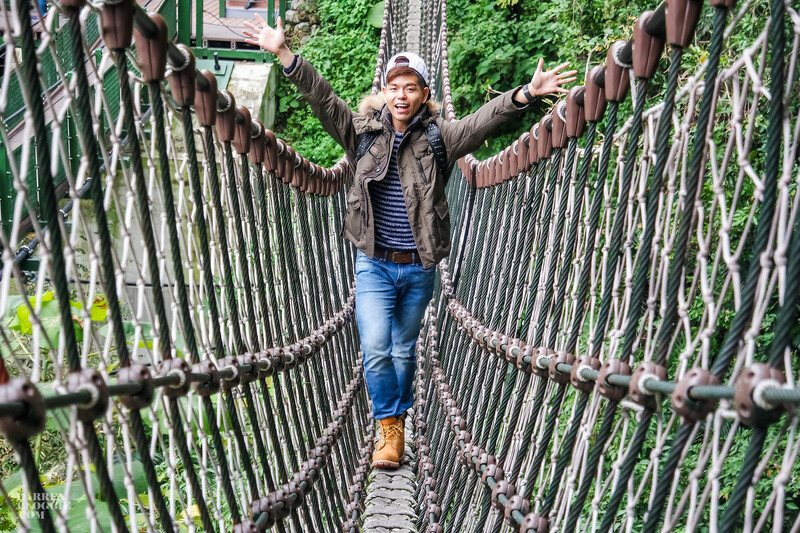 The original Pudu suspension bridge was reconstructed into concrete in 2003 due to safety reasons. 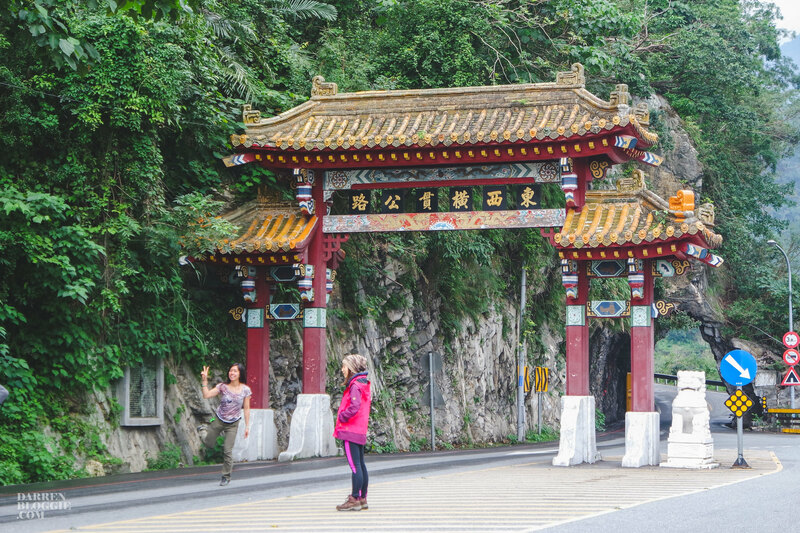 At one end of the bridge, you can see a tall White Robed Guanyin statue as well as a 7-storey high Tian Feng Pagoda, Giant Statue of the Bodhisattva, Xiangde Temple and Daxiong Baodian temple which became popular spots for visitors and worshippers. 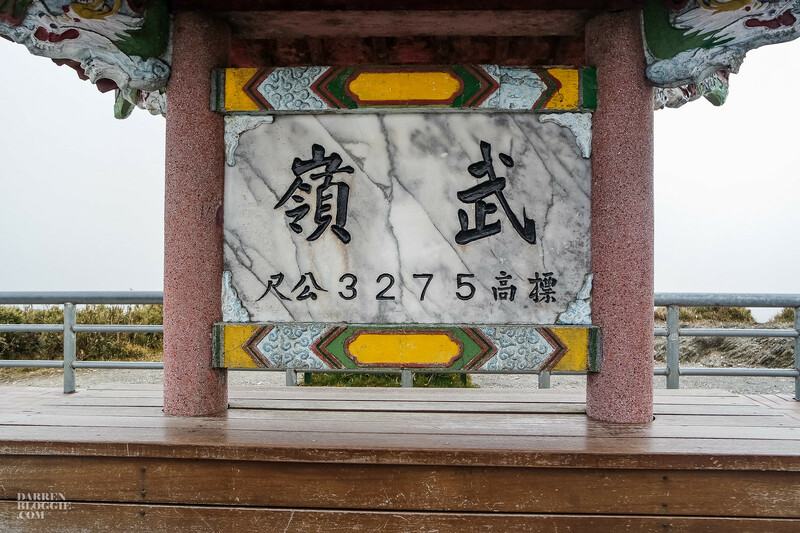 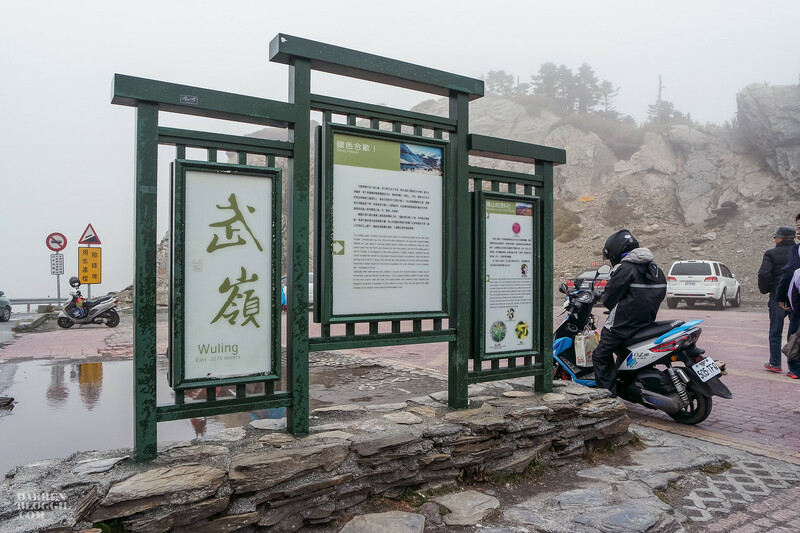 Just before we head down to Taichung, we stopped at Wu Peak (Wuling), at an altitude of 3275 meters, the highest spot of Taroko. 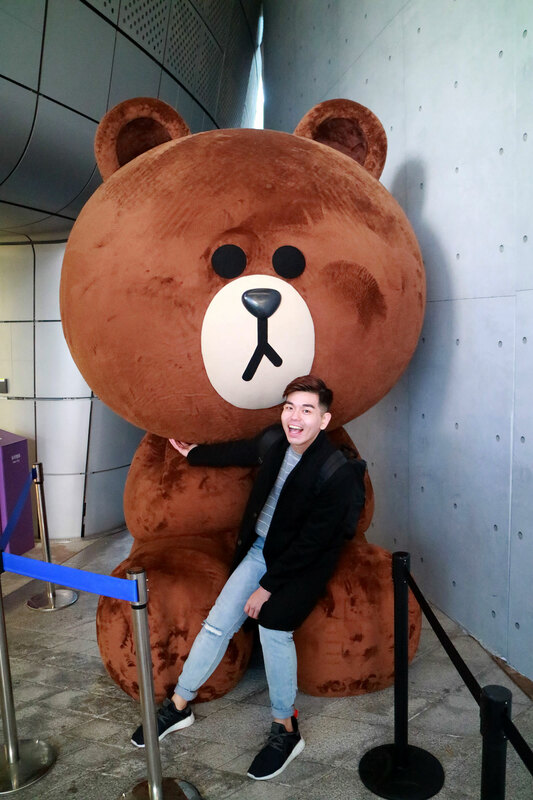 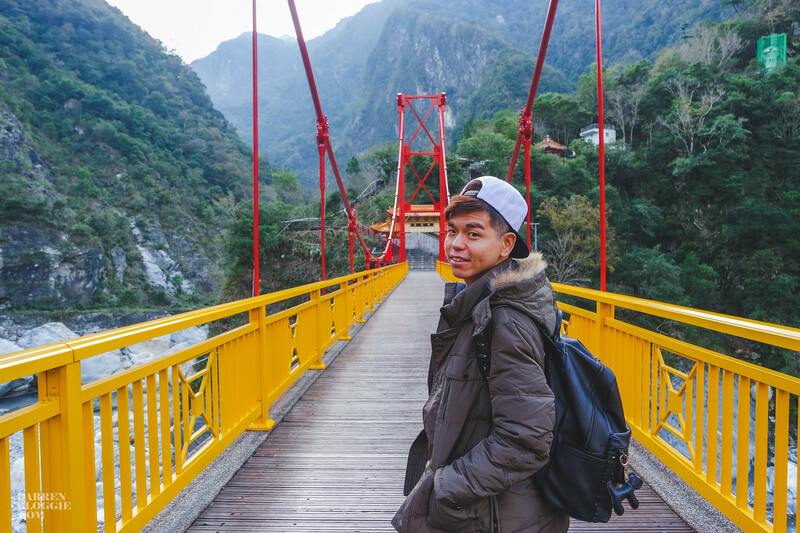 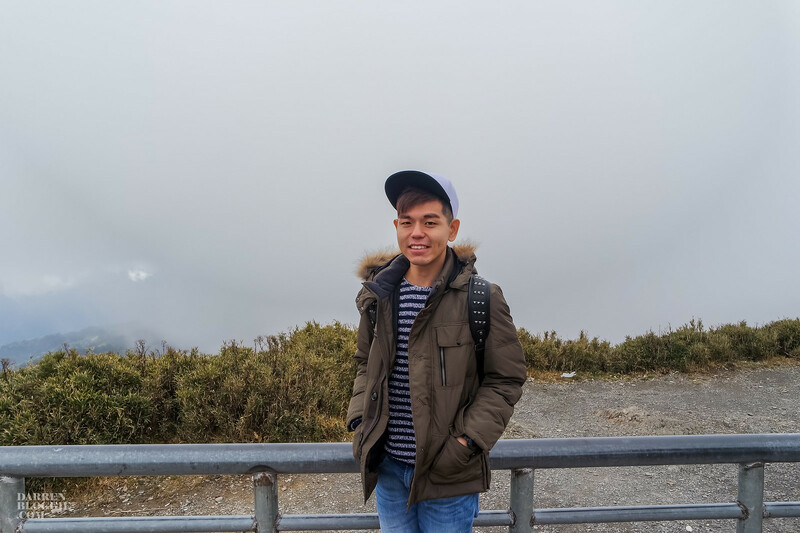 For the magnificent view of the peaks of Mt Hehuan, and the Yushan cane clad slopes, we braved through the freezing cold air as it was winter during our visit to snap some photo before we quickly head back into the car.